Keen-eyed readers of James Randi's weekly commentary will have noticed the following picture last week. It shows two astronomers, a doctor, a professional skeptic, a film producer and me attempting to commit suicide by taking massive underdoses of homeopathic sleeping tablets at the recent Australian Skeptics convention. Despite swallowing many more tablets than the recommended dose on the packet, we were all able to stay awake for Phil Plait's excellent talk about mad and bad astronomy. I was contacted by a journalist on Friday, August 26, for comments about homeopathy. The journalist was writing a piece about the study published in The Lancet which demonstrated, yet again, the uselessness of magic water treatment. I pointed her towards things I had written about homeopathy, explained the scientific vacuity of it and the fraudulent nature of claims that 200C preparations are actually made in practice, and commented on the irony that in the centenary year of Einstein's publication of his paper on Brownian motion we should even be talking about anything based on the idea of infinite dilution. The reporter took the time to ensure that she had my correct affiliations (with Australian Skeptics and the Australian Council Against Health Fraud) to go with any quotes of what I had said. You can see the final article here. I assume that I was not the only person interviewed who expressed scepticism about this quackery, but the only person quoted at all in the article was the president of the Australian Homeopathic Association, who dismissed the idea that clinical trials could say anything about homeopathy. And he got the last word. Sigh! As an aside, because Peter Torokfalvy from the AHA said that homeopathic preparations have to be individually prepared I sent the following email to him asking for his support in a campaign to remove homeopathic "medicines" from pharmacies. He has not yet replied. I see from an article about homeopathy in today's Australian that you say that homeopathy must be based on individual treatments. I assume from that statement that you are just as opposed as I am to the sale of prepackaged "homeopathic" products in pharmacies. I look forward to working with you and the Australian Homoeopathic Association to rid pharmacies of these false "homeopathic" products, which by both your definition and mine can only be considered to be examples of quackery and medical fraud. Last month I was challenged by a homeopath to put my mouth where his money was and to take some 200C belladonna tablets. When I didn't immediately respond he sent me a couple of emails suggesting that I was too scared to take the pills, so I told him that I was going to take a massive overdose at a coming dinner meeting. He then told me that this just showed that I didn't know anything about homeopathy because he had told me that to get the effect (an effect which was not specified) I had to take one pill every hour for twelve hours. I have now done that as well, and the effect was surprising. Well, it would have been surprising if I had been expecting to suffer the effects of belladonna as set out in my excellent 1930 book on these matters, A Modern Herbal by Mrs Maud Grieve, where it says that I should have been experiencing "Strange indescribable feelings with giddiness, yawning, staggering or falling on attempting to walk; dryness of mouth and throat, sense as of suffocation, swallowing difficult, voice husky; face at first pale later suffused with a scarlatiniform rash which extends to the body; pupils widely dilated; pulse, at first bounding and rapid, later becomes irregular and faint". What I actually experienced was nothing at all. So, the situation at present is that when I take the pills as directed nothing happens, and when I take a week's worth at once nothing happens. But what else would you expect from something which, according to its label, contains nothing at all. This shattering revelation of the plausibility of homeopathy fell into my inbox this week. I thought I would send you a link to an interesting article, relevant to the articles you have ranting against homeopathy on your site. I don't use homeopathy, but I found that your derisive approach to the principles of it was pompous and motivated by an inflated ego rather than a desire to help people. As is often the case, diatribes concerned with beating one's chest rather than with the pursuit of truth expose one to ridicule: and I found this New Scientist article provides a satisfying dose of truly scientific behaviour in relation to homeopathy. Although this does not rightfully consititute 'hate' mail, I do hope you include it on your site. 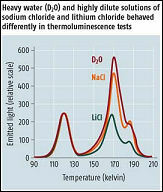 Ultra-high dilutions of lithium chloride and sodium chloride (10−30 gcm−3) have been irradiated by X- and γ-rays at 77 K, then progressively rewarmed to room temperature. During that phase, their thermoluminescence has been studied and it was found that, despite their dilution beyond the Avogadro number, the emitted light was specific of the original salts dissolved initially. The experiment has not been replicated in the last four years, not even by the original researcher. The experiment was not blinded, so the researcher was aware at all times of what solution was being tested. The journal seems a strange choice for publishing this kind of research, particularly as the researcher was specifically trying to prove something about homeopathy. The experiment was carried out using heavy water because "it has stronger hydrogen bonds than normal water". Do homeopaths use heavy water? Without reading the full paper I can't say how many samples of each solution were tested, but each sample would have had to have been separately prepared from scratch and this is very time and labour intensive. If only one sample of each solution was tested, what is the variability of the measuring instrument, and were the differences detected significantly outside this variability? Was the "pure" water sample prepared in the same way as the others? If not, any differences could have been due to impurities in the control sample. I'm not going to suspend my disbelief in the violations of physics, chemistry and logic necessary for homeopathy to make sense (let alone actually work) until I see some real research. By real I mean replicated, double-blinded, and carried out by people who don't have a pre-existing belief in magic. N-rays, anyone? I would like to publicly thank all the readers who sent me copies of the paper I mentioned last week from Physica A which supposedly demonstrated that the theory behind homeopathy has some substance. The paper answered one of my questions - the water-only sample was diluted and succussed just like the active ingredient samples. The explanation for why heavy water was used instead of what homeopaths actually use was a little obscure, and seemed to be because D2O produces a larger effect in some circumstances. If this magnifies the effect to make differences easier to detect then it might have been a reasonable action, but I remain unconvinced. 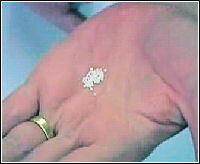 The experiment did not represent what is supposed to go on in a homeopathic factory. The paper was also ambiguous about who actually prepared the samples, and there is the real possibility that they were made by a manufacturer of homeopathic nostrums and the experimenters took the labels on trust. Regardless of who made the samples, the experimenters were not blinded and they knew what they were supposed to be testing at all times. René Blondlot would have felt quite at home in this laboratory. I thought I would let you know that you will be contacted by Dr Werner's Attorney shortly. I suggest you delete this video as it is in violation of copyright laws. It seems that each week brings a new example of the insanity of homeopathy. Here is the complete text of some instructions on how to use a homeopathic "remedy", written by someone who not only practises the fraud but teaches it as well. The writer is a native English speaker but appears here to be writing in a foreign language. 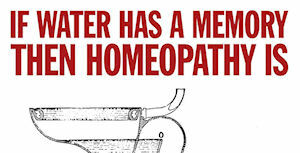 Perhaps it makes sense to a homeopath. PRINT this out and keep handy with your remedies. Do not treat for chronic or recurring things on your own or with 30C. Take one teaspoon out of water bottle and give to the person. Have person hold in their mouth for a few seconds if possible. Improvement you may see first is in mental/emotional symptoms, or sleep, or general well being, or thirst or appetite - then the physical symptoms may improve later If you are using 6X or something, may have to repeat oftener than a 30 C asthe energy 'gets used up' in a way. If you get near the end of the bottle, keep at least one teaspoon in there and add 6 ozs more of water to keep it going, as you have been raising the potency each time and don't want to start over. Mostly you will never get to this point as you will only be repeating 3 or 4 times. Don't need to refrigerate unless keeping overnight and usually this will not be the case. Throw all away at the end. See more cartoons by Prasad Golla at the North Texas Skeptics site. People sometimes tell me that alternative medicine practitioners are well-intentioned folk who just want to help others. I found some of these pillules in a (sadly, real) pharmacy with suggestions that they could be used to treat a wide variety of medical conditions. They were selling for $12.95 for a bottle of 125 pillules, or just over 10 cents per sugar ball. About five minutes with Google gave me a catering wholesaler who will sell me 8 pounds of the pillules for $US20 (plus delivery). Now tell me that the people selling these things aren't aware of the fraud that they are committing. A believer in homeopathy informed me that a scientific paper had conclusively proved that water has a memory and therefore homeopathy must work as claimed because skeptics can no longer deny scientific plausibility. Here are some graphs from the paper which apparently show very strong correlations between certain measurements. I invite anyone who has ever taught or studied introductory statistics to explain to me how these scatter plots support the claims of strong correlation. (Just look at those p values!) Write on one side of the email only and pay particular attention to explaining the number of points lying outside the 95% confidence range. You can see the paper here.